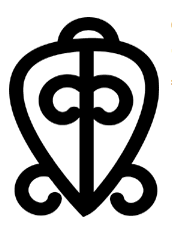 African proverb, represented by the symbol shown here, an adinkra symbol. I have already a handful of tattoos and a dozen more planned, from snakes to elaborate trees to all kinds of things. My admiration for African culture (someday, Ghana), particularly West Africa, and interest in art led me to take special interest in learning the adinkra symbols, all of which would make for beautiful body art, given the richness of the culture and the meanings behind them and what connections I find in them. I have a series of them planned across my body. I was recently debating what would come next – the snake or the series or maybe just one part of the series or a few other items I have planned. A fanciful consideration, given my current financial liberties. A few days shortly after this time given to mentally painting new ink in various places on my body, I entered into a very deep meditation. Yesterday, specifically. I do believe in the spiritual world, but this is not what I’m getting at here, especially as it’s particularly personal to me. What arose out of part of that meditation, however, was a resolution for where and what my next commitment would represent. It means “love never loses its way home.” It represents the power of love. I don’t think this needs much more interpretation, for the power of love is often philosophized and written about. I’ve never believed in anything like I’ve believed in a pure true love. Today, I find myself trying to shrug the experiences in meditation as coincidence. Swellin… Psych naw. But for real doe, that’s dope. Lol, for real, calling me out for swelling on my own page? Bold move, sir.